With two toddlers I probably won't even be awake at midnight, haha! Most fireworks even the family ones are on too late fo the little ones so we will have another quiet night in. That dress is just gorgeous and I love all your picks! I think I need those booties in my life now! What a gorgeous sequin dress! I adore the velvet boots with it too. Thanks so much for the link up! You look beautiful. I love the dress paired with those fabulous velvet boots. Just lovely. I am excited to see what you have planned for this year! I love this dress on you! This dress is divine and everything one needs in a NYE outfit. Looking forward to seeing your goals come to life in 2018. Best wishes. 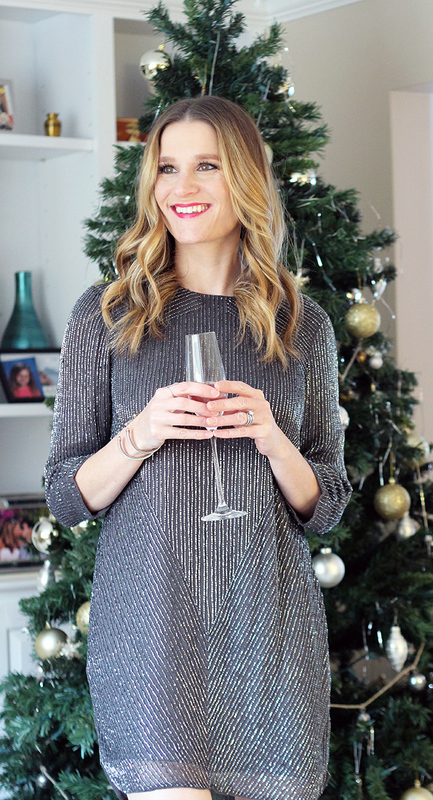 This dress is perfect for NYE! 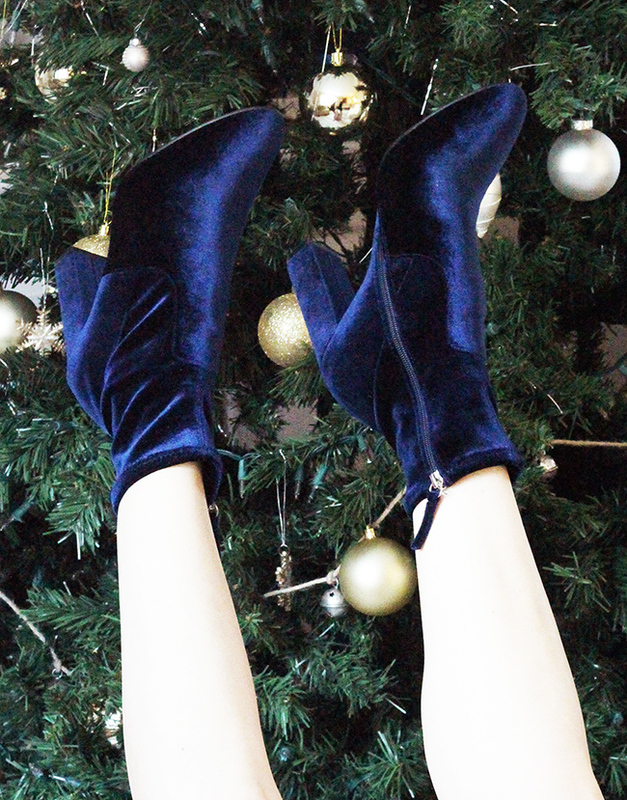 I just got a pair of very similar blue velvet boots that I shared yesterday on the blog! I had to click to see if they were the same ones! lol! I would love to do more videos. I did a few this year, but I'd like to learn more and build up my YouTube channel, too. I think thats a great goal! I truly love all things sparkly! This dress is phenomenal, Parker is the best! Beautiful look! Wishing you a wonderful 2018! This dress is gorgeous! I love how it sparkles. Perfect NYE dress! Happy New Year! I am glad you had a great Christmas with the boys, Rachael. Your indoor photos lately have been lovely. I cannot believe the year is over either. This sparkly silver dress is stunning on you and I love it with the blue velvet booties. Cheers to a Happy and Healthy New Year 2018 my friend. Enjoy the big night. I love your sparkly dress! It's perfect for NYE and those blue velvet boots look fab with it! Happy New Year! Perfect dress for New Years Eve! Happy New Year Rachael! Rachael, I love this fun sparkly dress and those blue velvet booties are perfect with it! I look forward to seeing what the new year will bring to your blog! Thank you so much for all of your support this past year. Wishing you many blessings in 2018, my friend. I am making my rounds now as Ada's co-host! Thanks so much for joining the Thursday Moda Link Up! Oh my goodness! THAT BLUE SUEDE!! I am obsessed with those! Also that sequin dress looks absolutely incredible on you! This dress is stunning! You look amazing babe :) Happy New Year! This year went by SO quickly! I'm absolutely loving your NYE dress and how sparkly it is. I plan on going full glam tonight haha. I rarely get the chance so I'm looking forward to it. Here's to a great 2018! I really love this glittering and shinning dresses trend right now. Yours is really lovely dear, and your hair looks stunning! Happy New Year! That dress is beautiful, love how it sparkles. The booties are so pretty too and the perfect pop of color to your look. This year was actually pretty rough for me, so I can't say I'm not glad that it's over, but even more reason to making sure 2018 is amazing! !